Hi friends! 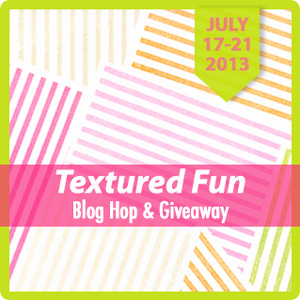 Danielle here for a fun blog hop today! Nina Yang (one of Neat and Tangled's own DT members!) 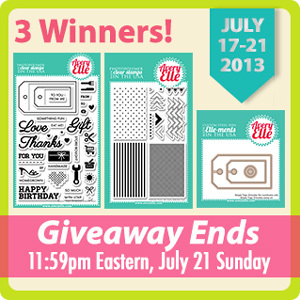 has designed stamps and dies for Avery Elle and I couldn't be more excited to help show them off in this awesome hop! You should have arrived from Nina's blog, which was the first stop. Today we are all showcasing Texture Tiles: Be Cool, which is a perfect set for adding interest, creating background, and fun accents! I am very into the mint and gold color combo at the moment, so I used it for this card. I stamped the stripe tile in Delicata gold ink onto some mint cardstock - perfection! I also used the little triangles to create the little border in gold as well. The sentiment is from Neat and Tangled's Everyday Circles. Lastly, I added a few enamel dots and gold sequins and ta-da! Hope you enjoy! Nina is so kind and giving away prizes to 3 winners! Winners will be chosen from comments on all the blogs along the hop so be sure to leave some love at each stop! You can also link up your own projects over on Nina's blog HERE. Next head over to Taheerah to see what she has created for you! And incase you get lost here is the full list blogs! so cute CAS card, loved the addition of enamel dots and sequins. Wonderful card--I like the mint and gold together. I love this CAS card! The enamel dots and sequins are fantastic. I have NEVER seen you make a bad card...all awesome, all the time. this is no exception! Oooo - BEAUTIFUL! I love this color combo too!!! Oh so lovely...... the mint and gold are so pretty together! No. Way. This card is gorgeous! I am swooning over the colors! very cute card.....loved the sequins n enamel dot. Danielle, this ROCKS! Seriously, love how funky and cool this is. Everything is perfectly balanced and I love the colors. What a striking card! Love the color combo and the combination of sequins and dots! This is so amazing!! I love the white enamel dots... they have them in white now?? Love the mint/white/gold colour scheme - fantastic card! Wow! What an awesome CAS card! I love the color combo! I adore this card :) the mint and gold combo works so well. I have to try it. Wow! The mint, gold and black is so crisp and striking. I don't think I would have ever thought to use these together and they are just stunning. Thanks for the inspiration! This card is so amazingly trendy I want to display it in an exhibition!! So so *so* amazing - a perfect combination of everything!! Hey girl! This is FABULOUS! I love the white enamel dots! So pretty! What a pretty card you made, really like it, thanks for sharing it. Beautiful! I adore the gold accents. What a great CAS card. Love the unexpected triangle detail under the striped element. GREAT banner at the base of the striped tile. What a stunning card. I LOVE the stamped triangles and the bold Hello sentiment. Thank you for the inspiration!! Very nice card...the black sentiment really stands out and love the triangles. This is a great stamp set and could be used in so many different ways. rest of the card really stand out. Please enter me in the giveaway. What a great card. Love the design and those white candy dots along with the sequins. Loving all the white space with your wonderful mint and gold. So well done! Love the look and the color scheme! This card is absolutely fantastic! I love EvERYTHING about it! Fabulous card! Love the sequin accents! Super color combo, love the sequines and the little triangles stamp that looks like banner under your stripes. Your caed is fantastic! Danielle, your card is WOWZA!!!! Love the mint and gold, and those tiny triangles are so sweet. Pretty pretty card. That tiny triangle banner look is a great idea. I love your wonderful card. Great use of the patterns. TFS. Love the color choice on your card...thanks for the chance to win such a great prize. Great card. Love the patterns and the "big" sentiment. Beautiful card...I love your sweet design and the bit of gold sequins, stunning. Great card. Love the details and the colors. Oh, wow! What an awesome, clean design! I so love this! Really like the simplicity of your design and the color palette. Simply cool - love the color combination and lined background! how very exciting! I love the card and the various types of bling, awesome! Awesome CAS creation! I love the touches of gold and the way the sentiment really pops!!! Cute cards and love the new sets!! I am a sucker for circles and love this set. Your card showcases it wonderfully. Danielle.....I LOVE this CAS card with the gold triangles and the coordinating sequins!!!! Beautiful job!!! I really love your card. The gold and aqua are super cool!